Opera Manhattan's spring festival packs an emotional punch, or rather three. The triple bill features short twentieth-century operas in widely differing styles, united by their focus on emotionally and psychologically fragile female central characters (not to say their emotional and psychological disintegration.) In the hands of Opera Manhattan's artists, these were presented as narratives of strength, as well as weakness. The evening began with Poulenc's "La Voix Humaine," Kala Maxym reprising her role as Elle, which she also sang with the company in February. Tristan Cano played the piano rendition of the score with impressive nuance in tone, supporting the emotional trajectory of the piece, sometimes articulating the truths which the singer cannot. 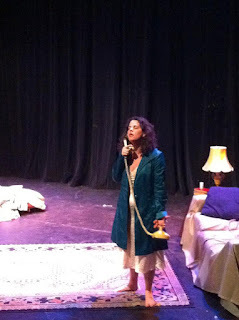 The monodrama was staged by Sarah Fraser, between a sofa and a disarranged bed. Letters are scattered over the floor--some lost among the bedclothes--relics of the relationship. Maxym's characterization was thoughtful and vivid; especially at the outset, "Elle" is anxious, fretful, preoccupied, distracting even herself from the central reality. There was the suggestion of vacillation between her public and private selves, as she wandered from the living room to the bedroom, and the boundaries between past and present blurred. Maxym's French was intelligible and expressive, and she used variation of tone color to powerful emotional effect. Strong and passionate in recounting the dream sequence, with warm high notes, she also demonstrated sensitive diminuendo, notably in speaking of the hotel at Marseilles where she and her lover had been happy. There are things, she says, which cannot be imagined without breaking the heart. The second opera on the program was Giancarlo Menotti's rarely performed "The Medium" (synopsis here.) The eerie score (for a chamber orchestra of 14) was played in a piano reduction by Kathryn Olander. 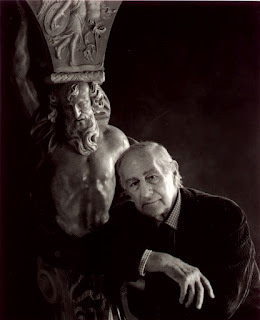 The opera had its genesis after Menotti attended a seance at the home of acquaintances who were bereaved parents. To his surprise, the composer noted that the mother seemed to see and speak with her daughter: "It was not she who felt cheated, but I." The drama is vivid in quotidian detail, its libretto, also by Menotti, dense with underlying significance. The choreography of Opera Manhattan's production, John Schenkel, was intelligent and eloquent of the characters' emotional histories. Mr. and Mrs. Gobineau, habitués of the seances, emerged as repressively pragmatic, insistent that everything be performed within its proper parameters, lacking the imagination to be disconcerted when this becomes literally impossible. Mrs. Nolan, the newcomer, was sung and acted with great eloquence by Anna Petrie. The mute Toby was given a passionate and nuanced portrayal by Parker Scott. His body language was extraordinarily expressive, and he had good chemistry with Monica (Megan Candio,) who plays on the threshold of adulthood. Candio has a sweet-toned soprano, and gave a touching performance as the naive Monica. She took a few minutes to warm up fully, but gave a haunting account of the dark lullaby. The scene where she and Toby waltz was of (for me, literally) breathtaking sensuality, and the way they found each other was beautiful. We never learn the true name of the mentally fragile medium who is so afraid of her own dead. To Monica she is simply Baba; to her clients she is Madame Flora; to the audience she remains an enigma. We know only that she has seen too much, and learned to survive. This complex role was sung with lots of character and hybrid style--much use of Sprechstimme in dialogues--by Elizabeth Moulton. Thanks to the force of her presence, the seance was genuinely eerie; thanks to her dark mezzo, her drunken, desperate monologue was mesmerizing. Confronted with her unimaginable reality--that the dead who sink down into the earth can speak--she is finally shattered by the weight of all she has lived through. Gentle Readers, I can only say that it is perhaps ill-advised to go into a performance of Suor Angelica in the emotionally fragile state to which I had been reduced by the first two-thirds of the evening, and that I wouldn't have missed it for the world. The loss of Puccini's lush orchestration is regrettable, but Tristan Cano was again excellent at the piano. Standouts in the community of nuns were Anna Petrie (again!) as the monitress and Rachel Arky as the abbess. Elana Gleason, as the compassionate and feisty Sister Genovieffa, displayed a bright, warm soprano. Anna Yelizarova was a much younger and more fabulous Zia Principessa than I am accustomed to, but seemed vocally tense. The Suor Angelica of Kristi Bulot grabbed my attention with her first notes, and gave a vocally and dramatically compelling performance. Bulot portrayed Angelica as a passionate visionary, unremittingly intense in expression. In Bulot's coloring of her voice, in her use of text, in her body language, it was clear that the constant work of renunciation is the determinant factor in Angelica's experience and actions. She is tender with the older sister--"O sorella, sorella, la morte è vita bella!" -- and even the giving of the wasp medicine was made poignant. When I cried during this scene, those sitting behind me giggled (surely at least a venial sin? ); when I sobbed during "Senza Mamma," I don't think I was alone. Bulot has a strikingly lush Puccini soprano, from strong gravi to brilliant top notes which she was capable of bringing to pianissimo. The final scene was striking for her confident serenity. Her fear of damnation was no less well portrayed, but the radiance of her expectation remained most striking. Her vision, the production suggested, was delusional, even if her hope of grace was not. The festival runs through the 21st, with alternating casts except for the Poulenc. Each opera is worthwhile; if undertaking them all on one night, proceed with caution and tissues. There was a time when The Medium was everywhere. In general Menotti has fallen out of favor. Maybe the revival of The Last Savage begins a revival. Small companies in NYC have done Saint of Bleecker Street and The Medium in the past year or two. I'd think that The Medium would be an attractive choice, as it's quite budget- and audience-friendly: English language, evocative and melodic score, small cast, and 14-piece orchestra. Menotti has, for the most part, been relegated to student operas. I directed the Old Maid and the Thief for my BFA thesis. 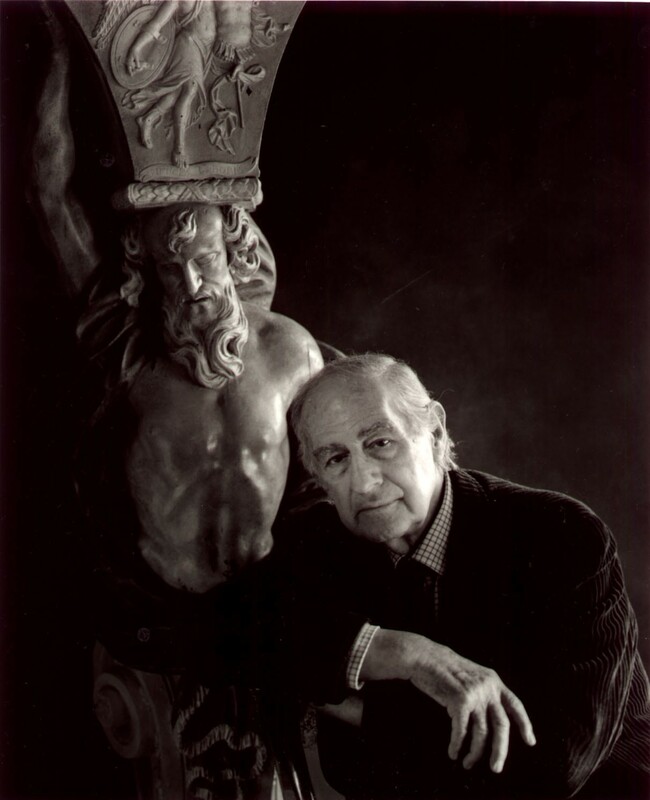 And Joseph Kerman basically trashed Menotti in Opera as Drama, which contributed to Menotti falling out of fashion. He was a wonderful dramatist, in my opinion, and wrote some beautiful music ("Steal Me Sweet Thief" still makes me a little teary). His operas aren't especially challenging within the larger context of music and drama (particularly given what was going on in music and drama at the time), but they're pretty solid. He was also something of a media pioneer - Old Maid was the first opera written for radio, Amahl and the Night Visitors was the first opera written for TV, and The Medium was presented on Broadway and Menotti directed a film adaptation... He was also the librettist for Vanessa (and was Samuel Barber's lover/longtime boyfriend). And he started the Spoleto Festival. And he has my birthday. The Telephone is also a really charming piece and was originally presented as a double bill w/The Medium (which has interesting connotations - people possessed by transmitted voices?!). Anyway. Menotti! Yes, it would be great to see more of his works around! Menotti! Thanks for the interesting info. I didn't know about Kerman's role in Menotti's fall from repertory grace, or Menotti's role in the Spoleto Festival. Intriguing thoughts about his exploration of new media and/in opera as well. As you say, his operas may not be musically challenging, but I've found them interesting (I'm sure your knowledge of them is greater than mine.) Hopefully their dramatic juiciness may help them recover circulation among small companies looking for something to mix with rep staples.